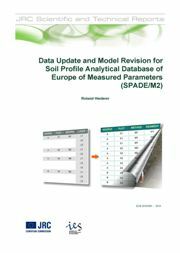 Database (2004) developed from the measured profiles; present in the Soil Profile Analytical Database of Europe of the European Soil Database v2. It counts 560 profiles within the EU. Since the incorporation of the profile database into the SGDBE and the release of the database in 1999 it has undergone only one change when in 2005 the information stored in separate files was transferred to a standardized format and stored in a database (Hiederer, et al., 2006). In 2008 original hard-copies on profile measurements were re-discovered at the National Soil Resources Institute, Cranfield University (NSRI). The values recorded thereon were found to differ from data of the SGDBE. To make the original data more generally available the profiles were added to the existing database. This step required changes to the structure of the database and a validation of the all entries for accurate and reliable data storage and retrieval. Figure 1 below gives an overview of the database evolution in time. A data validation process has been included. SPADE/M Version 2 provides an integrated data structure and offers the SPADE-1 "measured" data (560 profiles) as a Microsoft Acess Format Database. Download the SPADE/M_v2. The tables are already prepared to be linked using the data model supplied in the documentation. While the "measured" profile data from SPADE-1 are made available in digital format as separate spreadsheet files, these data have not been integrated into a single structure. The geographical coverage for SPADE/M is Albania, Belgium, Denmark, Estonia, France, Greece, Hungary, Italy, Luxembourg, Netherlands, Portugal, Romania, Slovak Republic, Slovenia, Spain, Switzerland, United Kingdom.